Eleanor Walesiewicz has been the quintessential IHA student since walking through those doors freshman year. Not only has Eleanor excelled in academics, but she has excelled in athletics and extracurricular activities as well. 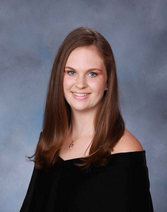 As a well-rounded student, Eleanor challenged herself as much as she could these past four years here at IHA, taking AP English, AP US History, AP Calculus, and AP Biology just in her senior year. Although Eleanor achieved in all her classes, her greatest talents are in mathematics and sciences. Eleanor has a special gift when it comes to numbers and figures and has always made sure to share that gift by helping other students who struggle. Eleanor frequently makes the Honor Roll and is an active participant in the National Honors Society where she is Treasurer. Eleanor will be bringing her academic strengths to Villanova University this fall where she will be majoring in Engineering. When Eleanor is not excelling in the classroom, she is shooting baskets on the court. Eleanor has been a member of the IHA basketball team all four years at IHA. She also ran Cross Country her freshman, sophomore, and junior year. Eleanor has always been a dedicated and supporting teammate. One would think that Eleanor would stop here, but, of course, as an IHA student, Eleanor exceeds expectations. Eleanor has been an editor for the school’s yearbook, Halcyon, for the past three years. Eleanor also has a passion for film, currently working on personal projects. Look out for a short film this summer! Eleanor is off to achieve great things and would like to thank the IHA community for all the support and tools they have given her to achieve in college and beyond.